With an area of 870 km² the Endau Rompin national park is the second largest national park in West Malaysia. It is located in the south of peninsular Malaysia and spans over two states, Johor and Pahang. The park takes its name from the Endau and Rompin rivers that flow through it. It was set up in 1989 to protect the endangered Sumatran rhinoceros. Within the park there are rock formation which are 248 million years old. A number of trails start in the Selai forest camp in the west of the Endau Rompin national park. These proceed along the Selai river and lead to a number of waterfalls: Takah Tinggi, Takah Tempaang, Takah Selow, the spectacular Takah Pandan waterfall and a number of smaller waterfalls. Wildlife is present in the Endau Rompin national park. Sightings have been reported among others for elephants and tigers, but it's not easy to spot large mammals in the deep jungle. The forest trails near the Selai camp are tough: steep, and very slippery when it rains, which happens quite frequently. In addition, because the altitude of the park is relatively low (the trails are in the 200m to 400m range), there is no relief from higher altitude fresh air, which means that walking along these trails is quite tiring due to the high temperatures. 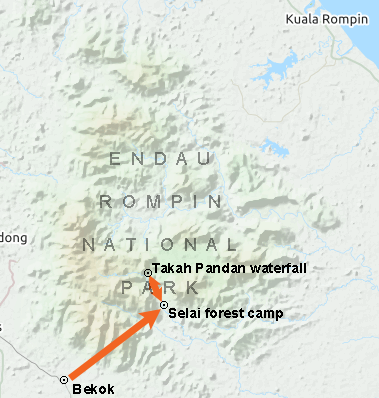 The Endau Rompin national park currently has three entry points: two in the east - Kuala Kinchin via Kuala Rompin (Pahang) and Kampung Peta via Kahang (Johor) - and one in the west in Selai via Bekok (Johor). It's possible to access the park with a tour, but independent travellers can also visit the park by making arrangements directly with the Johor national parks organisation (email address: jnpc AT johor.gov.my). 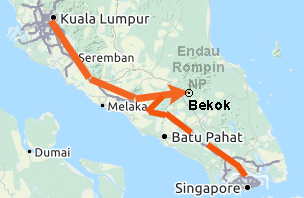 Bekok can be reached with a car transfer from KL or Singapore (either self-drive or charter a long-distance taxi; 3:30 hours drive from KL). Once in Bekok, travellers head to the Johor parks office in Jalan Satria 1, and pay the stay. After that they are transferred to the Selai forest camp with a 4WD car. The road is initially paved, but becomes a dirt track in the last section. The Selai camp has comfortable chalets with fan (no A/C), attached toilet and round-the-clock electrical power. There are also less expensive huts with no attached toilet about 100m from the Selai camp. The camp has a restaurant for travellers who booked the food package. Fees are as follows: entrance permit RM 21.20, insurance RM 2, chalet RM 180/night, jungle hut: RM 84.80, transfer to/from Bekok RM 281.20, guide (one day) RM 241.80, night walk RM 8.10, water tubing RM 12.40, key deposit (refundable) RM 50. Daytrips to the park are possible, but it's advisable to stay at least one night.